Depression and anxiety are no strangers to me. I’ve found that they often go hand in hand with chronic illness, but it’s easy to forget that they can be crippling all on their own. I appreciate how open and honest this post is, we need more discussions like this, now more than ever. 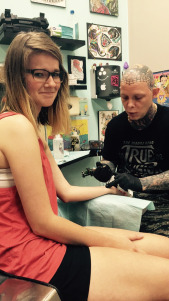 Today I went to a tattoo artist, and for $60 I let a man with a giant Jesus-tattoo on his head ink a semi-colon onto my wrist where it will stay until the day I die. By now, enough people have started asking questions that it made sense for me to start talking, and talking about things that aren’t particularly easy. We’ll start here: a semi-colon is a place in a sentence where the author has the decision to stop with a period, but chooses not to. 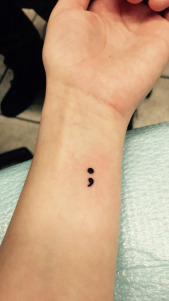 A semi-colon is a reminder to pause and then keep going. What makes a peron “real”? I need a moment to vent. I am sick and tired of seeing these “real women/men have…”, posts. Have we forgotten that there is beauty in diversity? Think for a moment how boring the world would be if we all looked exactly the same. Arguing over what we as individuals perceive as “beautiful” is as pointless as arguing over whether or not a person likes the flavor of strawberries. If you don’t like strawberries, fine! That just leaves more for me, I’m not going to sit here and tell you that you’re “wrong” for not liking strawberries or that simply by not liking strawberries you’re “shaming” those of us that do. I understand that the media has totally warped the public perception of beauty. Practically every image that we see on TV or in magazines has been photoshopped within an inch of its life. The people we see in advertisements, etc. are not “real” people; they are, at best, artistic interpretations of “real” people. This is a problem because it makes us criticize ourselves. We hold ourselves up to these “perfect” images and find ourselves lacking. We’re too fat, too thin, our teeth aren’t perfectly straight or we have too many freckles… The list is endless. My point is, out in the real world, no one can ever match up to these digitally enhanced images of “perfection”. No one. Not even the models that were in the original photograph. Imagine being that model: you go in for a photo shoot and it goes really well. Then the ad comes out and the pictures look nothing like you! They’ve taken 10lbs off of your frame, scrubbed away your laugh lines and your freckles, whitened your teeth… How must that feel to know that you, even with professional make up, hair and costumes weren’t good enough to make the final cut? The problem here is not with people as individuals, it’s with the media. So why is it that we attack each other? Instead of banding together to demand changes from the media, we sit at home and attack other individuals. Every single day I see posts on my Facebook feed about how some random person is “body shaming” one shape or another. So what if Susie has been working really hard to lose weight? She isn’t doing it to offend you, she’s doing it for herself. She has every right to proclaim how thrilled she is to have finally reached her goal weight. Just because she makes a big deal about it does not mean that she is making an attempt to shame anyone else. Yet, here it is, plastered across my newsfeed because Katie got offended by Susie’s weight loss and felt the need to accuse Susie of “fat shaming”. Suddenly, total strangers are rallying against Susie and everyone is upset because she was proud of the changes she worked so hard to achieve and wanted to share her accomplishment. Why is this ok? Even if Susie is a celebrity of some sort, why are we attacking her? Did she say “only people who look like this are beautiful”? Even if she posted her before picture and made a comment about how awful she looked, that’s her personal opinion, about her own body. Having her own opinion makes her “real” in my book, no matter what shape or size she is; if she is happy with herself, who am I to tell her she’s wrong? I whole heartedly agree that need to promote the idea that there is beauty in every shape, size and color, but attacking individual people because their personal view on beauty is not the way to do it. “Real” people have their own thoughts and their own feelings; have we forgotten that there is beauty in this as well?